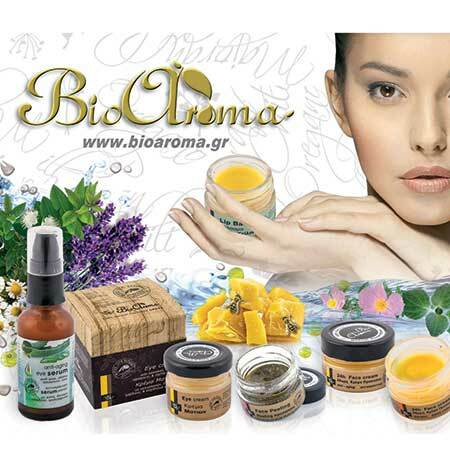 Anti-Aging Eye Cream Bioaroma was added to your shopping cart. Anti-Aging eye cream with Beeswax, Dittany, Labdanum and Myrtle Extract. Anti-aging eye cream Bioaroma directly reduces deep wrinkles and gives a youthful appearance to face. Ancient Myrtos or otherwise Myrtle, was a tree dedicated to Venus goddess and symbol of beauty and youth. The fruits of myrtle are rich in essential oils with strong anti-aging properties. The combination of myrtle, with the resin of Labdanum, Dittany and Beeswax make a powerful "weapon" against aging. Use: Apply a minimal amount of the anti-aging eye cream Bioaroma under the eyes up to the eyebrow arch. Repeat very gently until the cream is fully absorbed. Do not rub or pull the skin.